The Interaction of Geometry and Representation Theory. 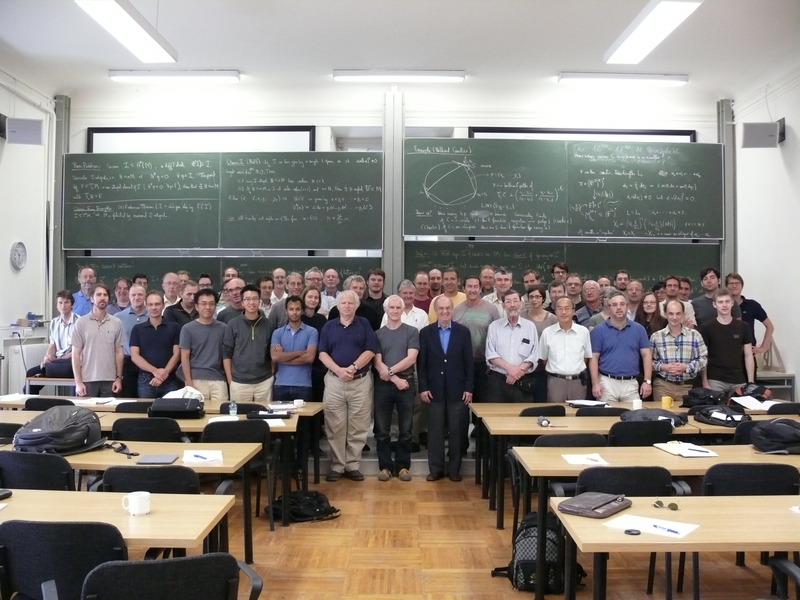 Two week thematical programme at the International Erwin Schrödinger Institute (ESI) in Vienna, supported by the Australian National University (ANU) and the Union of Czech Mathematicians and Physicists, branch Brno. Time: The activity is scheduled for September 3 - 14, 2012. The first week (September 3-7) will be a smaller scale workshop devoted to parabolic geometries and BGG sequences. The second week will feature a larger conference on relations between differential geometry and representation theory. During the second week there will be the opportunity to celbrate the 60th birthday of Michael G. Eastwood. Schedule for week 2 (with links to abstracts and presentations). Background and aims: The algebraic machinery discovered by Bernstein, Gelfand, Gelfand and generalized by Lepowsky went unnoticed in differential geometry for many years. But, as exposed by Eastwood and collaborators, this beautifully and systematically packages into a single framework a vast collection of equations and theory central to geometry, mathematical physics, and analysis on manifolds. The scope for extension was then realized immediately, and there has been somewhat of a revolution in the way many questions are attacked and solved. This has revealed data and structures not previously conceived of, often with strong links to classical problems, and the differential BGG complexes are a prototypical example. In some cases there are strong links to integral geometry. Overall, it is an open problem how to best harness the new information, and we hope that our workshop will help making further steps towards a solution. The application of representation theory to differential geometry is also suggesting novel and unexpected links between different geometric structures. For example the deformations of Riemannian structures are controlled by a complex originating in projective geometry. Related observations have already motivated new and successful treatments of classical problems. There is enormous scope for further exploration of this principle, which will certainly play a major role in the workshop. In a completely different way, links between different geometric structures were introduced by Fefferman, and Fefferman-Graham as a tool for treating the invariant theory of conformal, CR, and related parabolic geometries. These were their "ambient metric", "Fefferman metric" and "Poincare-Einstein metric" constructions. The influence of these, and the general ideas they suggest, cannot be overstated; the AdS/CFT correspondence of Physics is a variation on this theme and indeed most mathematical and scattering approaches to this correspondence draw heavily on the formal theory of the constructions mentioned. In different and limited senses it is understood how to link these studies to the representation theory picture above, extending this understanding has the potential for great impact. PDE of geometric origin, and geometric differential complexes. Geometric theory of differential equations. Symmetries of geometric structures and differential operators. Overdetermined systems of partial differential equations. Parabolic geometry and the Bernstein-Gelfand-Gelfand machinery. Poster session and preprints: To give all participants the opportunity to present their results, we will organize a poster session as part of the conference. An important part of this activity will be an online presentation of the posters, which will be accessible from this page. All participants also have the possibility to post preprints which are related to their talk or which they would like to discuss during the meeting via this page, to give others the opportunity to prepare for the activity. Proceedings: While we do not plan to publish proceedings, there will be a special issue of the journal Differential Geometry and its Applications associated to the workshop. All participants of the meeting are invited to contribute an article and all submitted articles will undergo regular peer review procedure following the same high standards as the regular issues of the journal. The five organisers of the meeting, Andreas Cap, Alan Carey, A. Rod Gover, C. Robin Graham, and Jan Slovák, will serve as Guest Editors. All participants of the workshop will obtain a free print of this special issue. The contributions should be submitted the same way as the regular papers of the DGA journal, i.e. as LaTeX produced pdf-file sent by e-mail to dga@math.muni.cz (link to an arxiv preprint is welcome as well). Please tell explicitly the contribution is meant for this special issue! The Editors will very much appreciate to get the manuscripts before December 31, 2012, the final deadline will be February 28, 2013. Participants: The following people have agreed to take part in the activity.